O’Sullivan Films has operated in Winchester since 1936. Continental AG, the parent company of O’Sullivan Films in Winchester, chose the Shenandoah Valley plant over a company facility in Mexico for a $10.3 million expansion. The project will add 61 jobs during the next three years at a site already employing 450 people. Big factors in Continental’s choice were the quality of the Winchester plant’s workforce and its consistent production track record, says plant manager Scott Krueger. The project will include extensive internal modifications and additional equipment at the plant. Jobs will be added in areas such as production, technical, research and development and support functions. Continental, a German automotive products company, acquired O’Sullivan in 2017, allowing the Winchester facility to “take advantage of opportunities at a higher level,” Krueger says. O’Sullivan began operations in 1896 in Massachusetts making rubber heels for shoes. It moved to Winchester in 1932 as O’Sullivan Corp. before becoming O’Sullivan Films in 2006. The company works with manufacturers in a variety of other industries including outdoor decking, and medical, residential and commercial flooring. 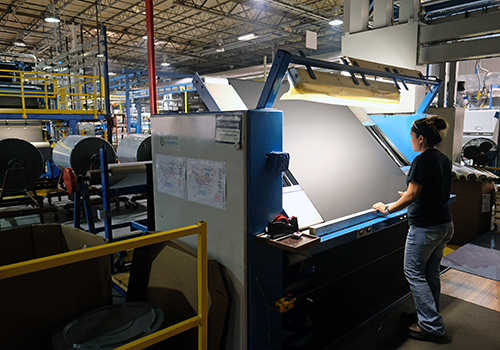 In connection with the expansion, O’Sullivan received a $188,000 grant from the Commonwealth’s Opportunity Fund and is eligible to receive state benefits from the Virginia Enterprise Zone Program as well as sales and use tax exemptions on manufacturing equipment. In filling new positions, O’Sullivan will conduct national and international level recruiting for certain jobs. “For our skilled trades, we recruit more locally,” Krueger says. O’Sullivan already is one of the largest employers in Winchester. “It’s part of our community identity,” says Shawn Hershberger, the city’s director of development services.